Among the world’s 52 species of neon-hued day geckos we find some of the most desirable of all lizard pets. It’s not easy to stand out among such a spectacular group, but one species does so admirably – the magnificent Giant Day Gecko (Phelsuma grandis). Although rarely seen outside of its native Madagascar until the mid-1980’s, this largest of all day geckos is now the hands-down favorite of many lizard enthusiasts. I’m still asked to design zoo and museum exhibits for Giant Day Geckos, despite the fact that public institutions tend to avoid “pet trade species” – their beauty simply cannot be ignored. The following information can also be applied to the care of 3 other large relatives that were once considered Giant Day Gecko subspecies – the Boehm’s Giant Day Gecko (P. madagascariensis boehmi), the Madagascar Day Gecko (P. m. madagascariensis) and Koch’s Giant Day Gecko (P. kochi). This stoutly-built lizard averages 9-10 inches in length, with large males reaching 12 inches. Clad in brilliant green and bearing maroon to red head and orange dorsal markings, Giant Day Geckos must be seen to be truly appreciated. Hobbyists have also developed an array of breath-taking color morphs. All day geckos are best considered as animals to observe rather than handle. Fast and alert, they will watch as you open the terrarium and may flee if possible; keep a net nearby to catch escapees. Their tails snap off with the slightest provocation, and the delicate skin tears easily. Although well-habituated individuals may accept food from tongs, these high-strung beauties are not for those seeking a hands-on pet. However, the careful keeper will be rewarded with a range of interesting behaviors, regular reproduction and pets that may live into their 20’s. The Giant Day Gecko occurs across much of northern Madagascar, and on several small offshore islands. Introduced populations are established on several of the Florida Keys (Little Torch, Plantation, Plantation and Big Pine). It has also been sporadically reported in Florida’s Dade, Lee and Broward Counties, and on Hawaii. Giant Day Geckos evolved in rainforests, but adapt well to some degree of human presence. In both their native and introduced ranges, they can be seen on building walls and in well-vegetated gardens. Giant Day Geckos are highly arboreal and must have climbing opportunities. A 30-55 gallon “high-style” tank will accommodate a pair or trio. Always opt for the largest enclosure possible. By virtue of their habits and need for security, all day geckos are ideally suited to life in terrariums provisioned with live plants; they will not thrive in bare enclosures. Plants such as Pothos, Snake Plants and Philodendron will provide visual barriers and a sense of security. Rolled cork bark and hollow bamboo sections make ideal hideaways and basking, perching, and egg-deposition sites; these should be arranged both horizontally and vertically. Be sure to establish plenty of basking sites near heat and UVB bulbs, as dominant individuals may exclude others from these important areas. A mix of potting soil, cypress mulch and sphagnum moss is ideal. Giant Day Geckos should be provided with a source of Ultra-Violet B light. Natural sunlight is best, but be aware that glass and plastic filter out UVB rays, and that fatal overheating can occur very quickly. A daytime period of 12-14 hours should be maintained. It appears that at least certain species can utilize dietary D3, and do well without access to UVB. I’m familiar with one exhibit in which Giant and Standing’s Day Geckos have bred over several generations in the absence of UVB (please see photo of female Standing’s Day Gecko with well-developed calcium reserves, or “chalk sacs”). However, there are a number of variables to consider…please see the article linked below for further information. Ambient temperatures of 82-85 F, with a basking spot of 88-90 F, are ideal. Nighttime temperatures can dip to 76-80 F.
Large enclosures will allow for the establishment of a thermal gradient (areas of different temperatures). Thermal gradients, critical to good health, allow lizards to regulate their body temperature by moving between hot and cooler areas. Incandescent bulbs should be used to maintain temperatures. 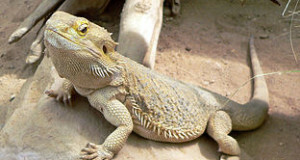 A ceramic heater or reptile night bulb can be employed after dark. 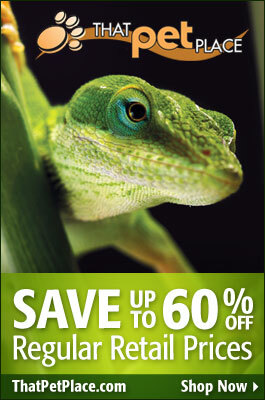 These rainforest-adapted lizards do best when humidity levels range from 50-75%. Their terrarium should be misted at least twice daily; a mister and hygrometer can be used to increase and monitor humidity if need be. Males will fight savagely and should never be housed together. Females are also territorial, and must be watched carefully. Pairs, trios (1 male, 2 females) and youngsters may co-exist in large enclosures, but be sure to check that all are able to feed and bask. A highly-varied diet is essential if you are to have success in keeping any day gecko species. Crickets and mealworms alone, even if powdered with supplements, are not an adequate diet. The diet should consist of roaches, sow bugs, crickets, butterworms, waxworms, cultured houseflies, silkworms and other commercially available invertebrates. 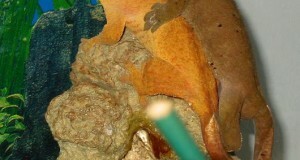 Feeders should be provided a healthful diet for several days prior to use. If possible, also offer wild-caught insects (avoid pesticide-sprayed areas, and learn to identify stinging and toxic species; please see the articles linked below). Moths, beetles, grasshoppers, tree crickets, earwigs, “smooth” caterpillars and a variety of others will be accepted. Your pets will definitely show greater enthusiasm towards novel foods! 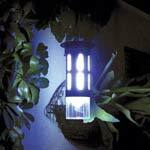 The Bug Napper Insect Trap will simplify insect collection. The natural diet also includes nectar, ripe fruit, pollen and sap. A mixture of fruit-based baby food, honey or molasses, liquid reptile vitamins, and ReptiCalcium with D3, mixed with enough water to achieve a syrupy consistency, should be offered 3 times weekly. Experiment with the ingredients, and add a bit of over-ripe papaya, mango and banana on occasion. 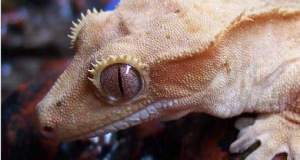 Your geckos will prefer to take nectar from cups suspended above-ground. Please see the article linked below for further information. Important food supplements include Zoo Med ReptiCalcium with D3 or a similar product (most meals) and a vitamin supplement (i.e. ReptiVite) 2-3 times weekly. Day Geckos rarely drink from bowls but will lap water that is sprayed onto foliage.